Solid Red Grosgrain Hair Bow is the perfect red bow. It is a brilliant red color with 1.5 inch wide grosgrain ribbon and wrapped in the center with a French knot. Ready to go on a French clip. 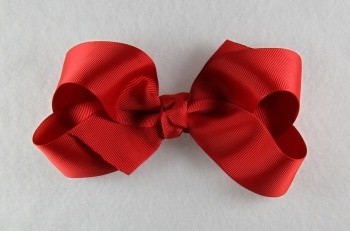 Pure and simple yet every girl needs a great red bow in their bow collection. Get this bow to match her school spirit shirts, this is the perfect touch for all her school outfits too!